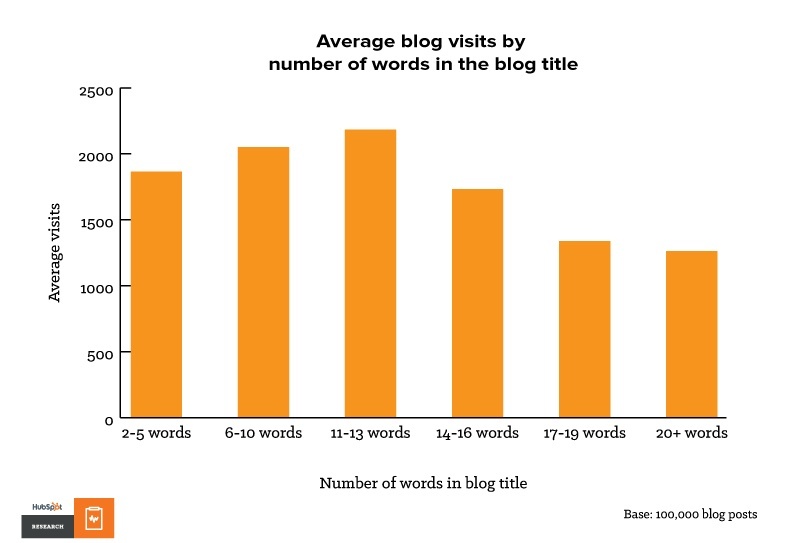 HubSpot Research analyzed blogging data from more than 15,000 companies.1 Based on our analysis, HubSpot recommends that marketers focus on “compounding” blog posts — posts whose traffic grows steadily over time. These posts are far more valuable than “decaying” posts which deliver a surge of traffic and then decay over time. While only one in ten posts are compounding posts, they account for 38% of total blog traffic across our sample. To maximize the chance of creating a compounding post, write articles that solve readers’ problems, are easy to scan, and feature words like “how” and “why” in the title. Compounding posts grow. Decaying posts don’t. When we measure the long-term value of blog posts, this distinction is central to success. Figure 1: What are compounding posts? Let’s start by looking at how most bloggers think about traffic. Traffic for a typical blog post peaks when it’s published and then decays quickly over time — usually in days if not hours. We call these types of posts “decaying” posts (see Figure 2).2 Like Hollywood executives tracking opening weekend numbers for a film, marketers focus on generating “big numbers” when the post goes live to recoup the time and effort put into to creating it. This creates a cycle: We expect visits to trickle to a stop, so after a post goes live, we turn our attention to the next premiere. This “opening weekend” model is a reliable way to draw an initial surge of traffic to your website and help build an audience from that traffic. Yet given the short half-life of each article, these posts put marketers on a treadmill as they seek to grow traffic overall. A steady stream of traffic demands a steady stream of posts, which in turn requires consistent effort from your staff. It’s more efficient for content marketers to create “compounding” posts that generate accretive traffic. The signature characteristic of compounding posts is that they eventually surpass the initial traffic that they generate at publication. Compounding posts may not necessarily be blockbusters when they’re first published, but their structure and substance are so relevant that they continue to deliver value and grow traffic organically and without additional marketing. We computed the rate of growth of almost 2,000 compounding and 18,000 decaying posts from top performing business blogs (see Figure 3).2 Based on our analysis, if you publish a compounding blog post in January, you can expect it to receive 2.5 times as many visits per month by July. (Click to tweet) In contrast, if you publish a decaying blog post in January, by July you will attract less than a fifth of your initial audience. 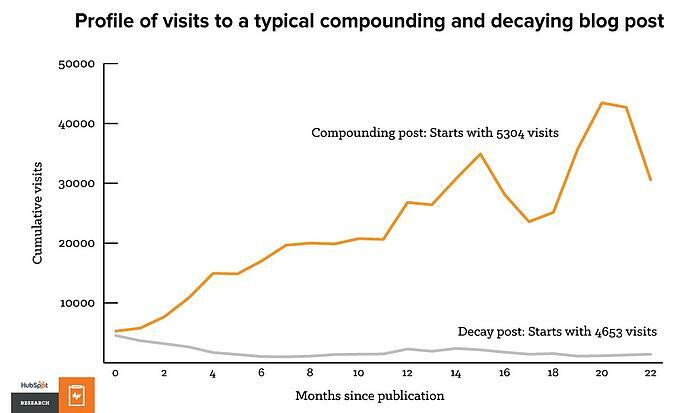 Note that the trajectory of visits for a compounding post is not a constant, sustained upward march. External factors like seasonality affect the size of the audience at a given point in time. Don’t expect a steady increase in visits month over month; short-term variability affects even the most popular compounding posts. In our sample, roughly one out of ten blog posts are compounding. Blogs that achieve this ratio of compounding to decaying posts are in great shape to build and maximize visits to their website over time. Over its lifetime, one compounding post creates as much traffic as six decaying posts. (Click to tweet) A single compounding post provides much higher return on effort to better target leads and are intended to generate sales. 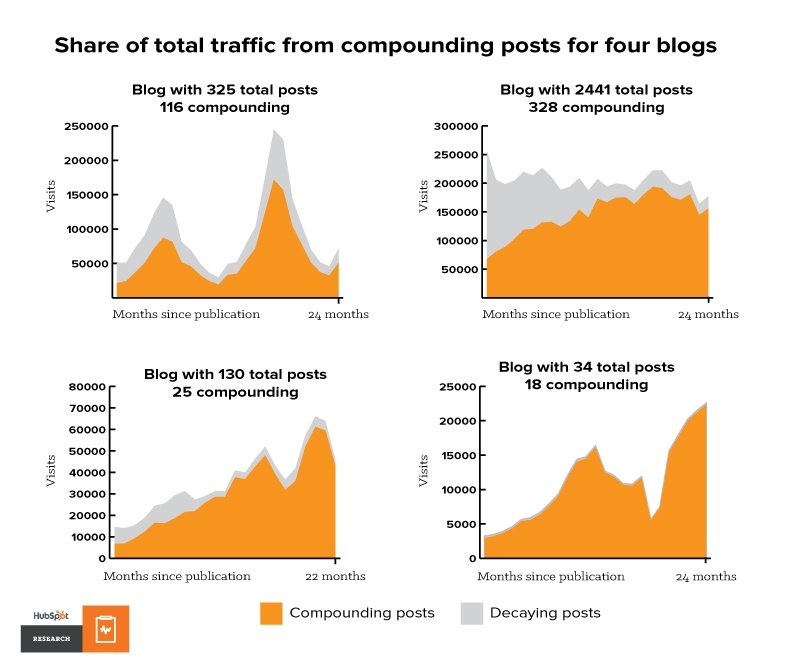 Figure 4 below highlights the impact of compounding posts with charts of the traffic to four different blogs over a two-year time span. The orange area represents visits from compounding posts, while the gray represents visits from decaying posts. These blogs reflect the extra value that compounding posts create, especially for marketers that have cracked the formula and generated more compounding posts than average. To gauge the overall impact of compounding posts, we analyzed traffic across 20 high performing business blogs. In our sample, compounding posts made up 10% of posts, but generated 38% of total traffic. (Click to tweet) Compounding posts contribute powerfully to overall traffic months and even years after their original appearance. 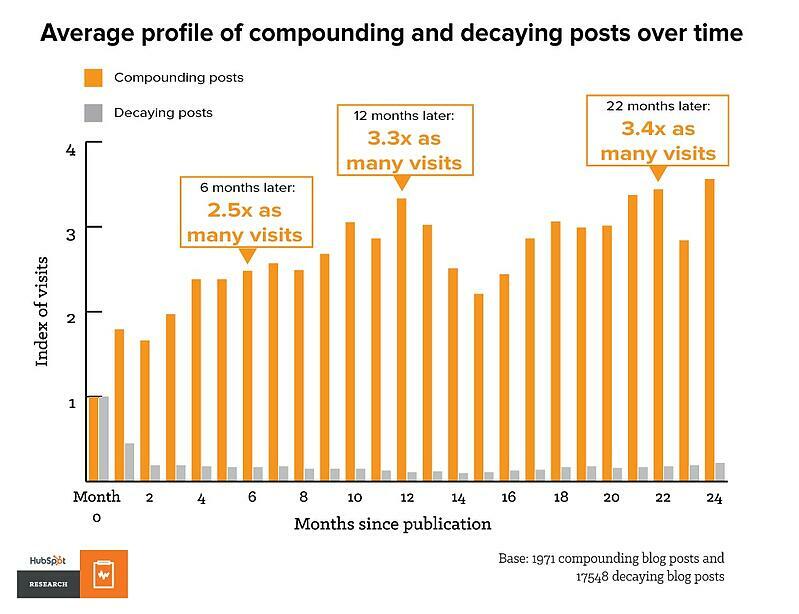 Figure 5: Compounding posts make up 38% of overall traffic As marketers publish additional compounding posts to their business blogs, they reach a point where a minority of articles generates the majority of visits to their blogs and perhaps even to their corporate websites. This consistent traffic boosts a webpage’s search ranking, leading to more organic visitors, and potentially more business contacts and leads. The compounding formula varies according to your industry and customers, but the posts do share common characteristics. While you can’t always predict which content will become compounding, we have found some commonalities in posts that grow in traffic over time. In this section, we’ll go over which types of posts tend to compound, how to choose a topic focus, how to title a compounding post, which types of content to include, and how to structure the post. Most compounding posts are tactical. They intend to help readers, typically by providing instructions. These articles fall into one of three categories: broad tactical, narrow, or topical. Broad tactical posts are the most likely to grow and compound. In Figure 6, we give example of these three types of posts for a hypothetical dental practice. Broad tactical posts attract ongoing attention. If you’re trying to create a compounding post, write about a broad topic and offer tactical advice with mass appeal. In other words, write for as large as possible a segment of your potential customers. Broad tactical posts include product reviews, breakdowns of processes, or instructions on how to diagnose a practical, mechanical, or health-related issue. As a compounding post generates more traffic, its search authority increases, generating more search hits and more traffic in a virtuous cycle. Narrowly focused posts rarely grow. Posts that cover niche topics appeal only to a subset of your total audience. Because the total audience is small at the outset, narrowly focused posts generate less traffic overall. Since the number of people searching for the topic is also low month-over-month, these posts have little search authority and rarely compound. You may want some narrowly focused posts in your content mix to speak to those niche audiences, but note that they are unlikely to compound. Position your blog titles so that they address an evergreen topic within your industry. Titles should be relevant to as many visitors as possible. Remember that most people are searching for answers using phrases like “ the best product for xyz” or “how do I do xyz”. Your blog titles should reflect common search phrases, and, of course, the content should provide useful answers. This strategy will increase your post’s chances of growing traffic over time. 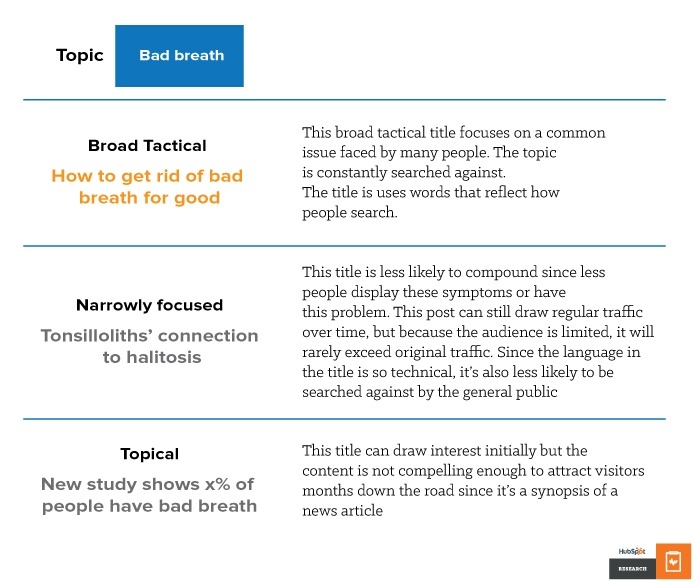 The chart below highlights how a minor change in focus on a given topic can turn your post from one that follows a standard decay pattern into a compounding post. 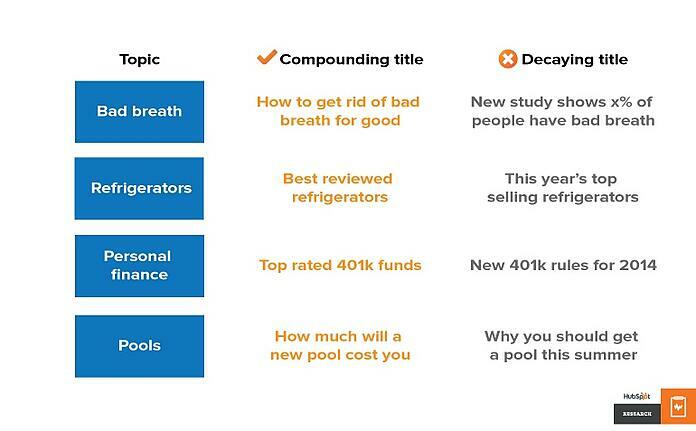 We analyzed the titles of compounding posts to see what words appear most. Compounding titles contain words that suggest certainty and utility, such as “How”, “What”, “Why”, and “Best”. Words like ‘your’ relate directly to the visitor’s own problems. While the words in Figure 8 appear most frequently in compounding titles, they’re not required; if you have a great title, you can deviate from this list. These terms are also common in search engine queries. When crafting titles, a good starting point is to search the topic online. Since search engines typically match keywords to a search query, the search results can give you a good foundation for your title. Answering a question by defining an idea or product: What is xyz? and/or prices: Which is better?, What is best?, Or x versus y? Advising readers on how to accomplish something: How to do xyz. Offering a definitive answer on something: The best way to do x. Pointing out elements to consider when making a choice: Be aware of xyz when considering abc. We also found that the posts with the most traffic consistently had 11 to 13 words in the title. Shorter titles can also pull in substantial traffic. Avoid titles of 14 words or longer. Write posts that answer the common questions you receive as a business owner or brand representative. If you have the answer, share it. Topics that may be intuitive to you may not be clear as your customers. Chances are there are thousands of people online asking the questions you hear daily. Anticipate follow-up questions and answer them in the post. Many compounding posts share content beyond answering a basic question. They further explain a concept, offer additional considerations beyond the core question, or give anecdotal insights on the topic. For example, a kitchen appliance seller with compounding posts included details like a note on the electrical requirements for a washing machine--something that most people don’t consider when researching which models to buy. The post also included a comparison of product guarantees offered by different brands and highlighted which had the longest warranty or best terms. Update older posts that have performed. For example, if a post on popular car models has consistently drawn in search traffic, and new models have been released since your post, update the content with new details. This update keeps compounding posts relevant. If you sell goods or technical services, visitors to your blog will be seeking practical, authoritative advice. Here’s how to deliver it. Build up a set of useful posts. For complex topics, like understanding electrical components or installing a pool, break down the basic components or steps of that process and outline requirements for each step. In subsequent posts, add updates about advances in the technology or technique and give advice on what type technology is best. Add links to these shorter posts in the original, in-depth, tactical post. Short posts like these quickly build up a library of information. Strive to answer common questions. Why are certain things set up the way they are? Why is this item designed the way it is? Why do I need to do this? Explain things that may be mystifying to people new to the topic. Help people make choices. When discussing a class of products, try to include a review, rating, and/or price breakdown of the different options available. If you are recommending one product above the others, include the word “best” in your title, and justify why you made that choice. Teach your visitors about a topic or how to do something. Share an easy to replicate recipe or explain a new type of treatment. Explain and diagnose the things that are asked about most commonly in your line of business. Illustrate your points with strong, relevant, and research-based examples. For example, a career services firm might share sample resumes and discuss the steps someone needs to take to move up in their career in a specific industry. Use data to back up your statements. Decipher confusing processes. Take a clear, step-by-step approach. Explain a concept or jargon in layman’s terms. For example, you could explain how to file paperwork for medical reimbursements with your insurance company or how to submit a certain type of form. Bring in an expert. Interview them and share their expertise with your visitors. Leverage their knowledge to help build your audience. 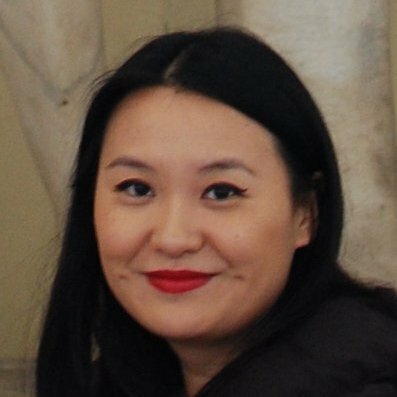 Engaging with thought leaders also strengthen your blog’s reputation and lends an objective third-party legitimacy to your content. Images. 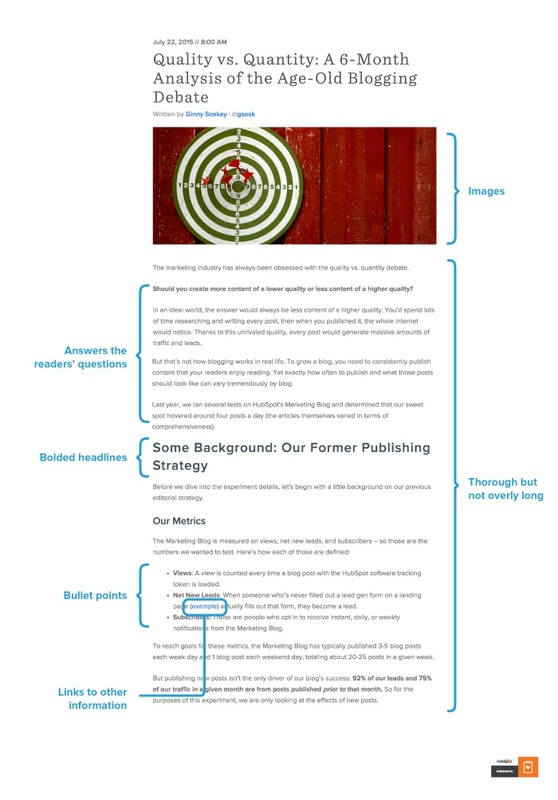 Images add visual interest to content and break up long sections of text. For comparisons and reviews, include example or side-byside photos, and specs of the products you’re comparing. When explaining a concept, diagram it out for visual learners. Images can also inject humor and brand values. For example, a fairly dry post explaining how heater ducts worked included an informative hand-drawn diagram of the airflow mechanism and a picture of little dog wrapped up in a blanket. Easy-to-skim structure. Use bold headlines to sum up sections. Use bullet points to make your conclusions clear. Add images to break a longer post up into sections, especially if you are reviewing different products. Links within the blog post. When explaining concepts, link to previous posts that give additional explanation to provide value for a reader who does not have significant background knowledge. Posts that simply define “insider” terminology within your industry can be effective. A length that’s short but thorough. Write enough to give satisfactory answers and detail for a particular topic. Err on the side of brevity, but don’t skimp on the details. Not many readers have the patience for a 2,000-word post. And nothing frustrates readers more than a 200-word post that barely covers the topic they’re interested in. Analyze your blog’s best performing posts to find your sweet spot for word count. The key to creating compounding posts is to create a library of useful content that boosts your search position, driving traffic to the blog. For any individual post, regardless of how hard you try, you can’t count on creating a compounding post. Instead, you must follow a blogging strategy that is most likely to generate compounding posts over time. Concentrate on two things: your blogging schedule and your keyword strategy. Business blogs need a baseline of content to be ranked by Google and appear in search results. To attain this sort of ranking, publish content regularly. For a new blog to become a high performer, you must publish quality posts consistently. Google treats posts as high quality if they include vital, useful, or relevant content. Your posts need to be comprehensive enough for a reader to walk away with the answers. Write for a target customer, not for a search engine. Don’t rehash popular posts that already exist; you’ll lose out on search. After you have established a baseline of content with a collection of useful posts, turn your attention to balancing your editorial calendar. Aim to publish 10% compounding posts, like the top performers in our sample. It’s better to take the time to build quality content rather than stuffing the blog with many ”filler” posts. Marketing leaders need to allocate additional time and resource to craft compounding posts. They require more effort to write, but will return six times the traffic you’d receive from a single decaying post. The tradeoff for that effort is a higher number of compounding posts — and the more compounding posts you have, the more sustained traffic you’ll generate. Every compounding post will help your organization attract new traffic, which in turn increases your ranking for keywords, which makes your blog and website more discoverable in organic search. The top business blogs featured in this research ranked high for multiple keywords that were relevant to their business. These include many long tail keywords and a few broader, more general “head terms” (see Figure 12). Long tail keywords are valuable because they’re less competitive than head terms. Long tail keywords also comprise 70% of search traffic. Visitors to your site who searched on a long tail keyword already have a good idea of what they’re looking for. Finally, ranking highly for a long tail keyword means your content is more likely to appear as a search result in the first page for that term. Placement in the first search page has a huge impact on how likely someone will click into your website. To get started, compile a list of phrases your target customers search for. Incorporate these into your keyword strategy. 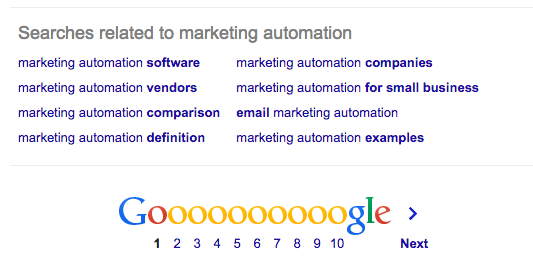 Then use your keyword or SEO tool to find related search terms (see Figure 13). Add these related terms to your list of keywords. Once you’ve established your keyword list, use your keyword tool to find out how often these terms are searched against, how difficult they are to rank for, and if your key competitors are ranking against those terms. Finally, pick the top performing keywords and write broad tactical blog posts around them. For example, if you found that the long tail keyword “best camping gear” gets a lot of search traffic, write posts with titles like “8 Brands That Sell the Best Camping Gear” or “The Best Camping Gear For Your Next Summer Adventure”. Over time, monitor your keywords to see how competitive the phrases are and how often they are searched. If new terms crop up and old terms fall off, adjust your keyword list and strategy accordingly. We’re often asked “how can we write blockbuster posts that generate tens of thousands of visits when they gets published?” But optimizing for short-term traffic is far less valuable than embracing a “complete picture” understanding of a blog’s value. Blog posts that pull in visitors day over day, month over month will attract more visitors over time than will a post that enjoys a big “day one spike”. These compounding posts are workhorses that provide a much better return on your investment. Invest your marketing team’s time and effort to prioritize creating compounding posts. As they attract traffic, marketing can cultivate visits and eventually capture names, generate subscriptions, and convert leads. More importantly, if you follow these instructions and create compounding posts, you shift from being one of many suppliers of content in your industry to an authority. Compounding posts indicate that you have created something that your target audience believes in. Being seen as an authority gives your organization opportunities to generate even more influence on all the other topics in your field. Compounding posts allow marketers to a step beyond short terms gains and into creating a position of thought leadership for your brand. 1 In May and June 2015, HubSpot Research reviewed customer traffic data across HubSpot’s customer base. 2 Based on traffic analysis, we identified 20 blogs with the highest overall visits and/or the highest average number of visits per post. 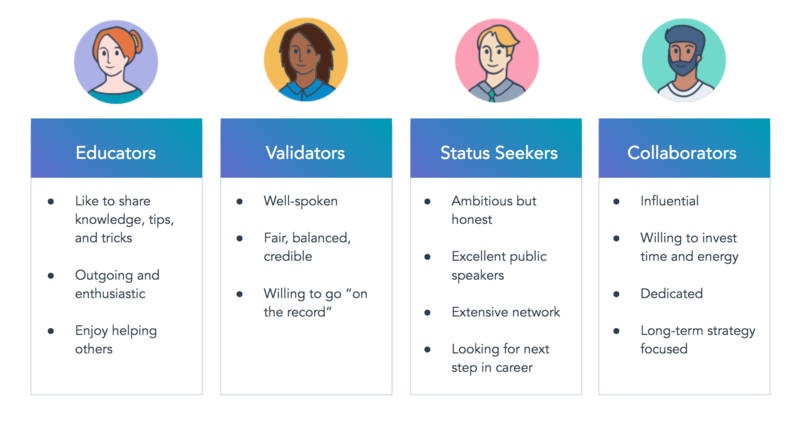 We categorized them as high performers and reviewed their blog posts for further in depth analysis. 3 Across 19,519 blog posts, we found that 1 in 10 posts are compounding 12 months after being published. 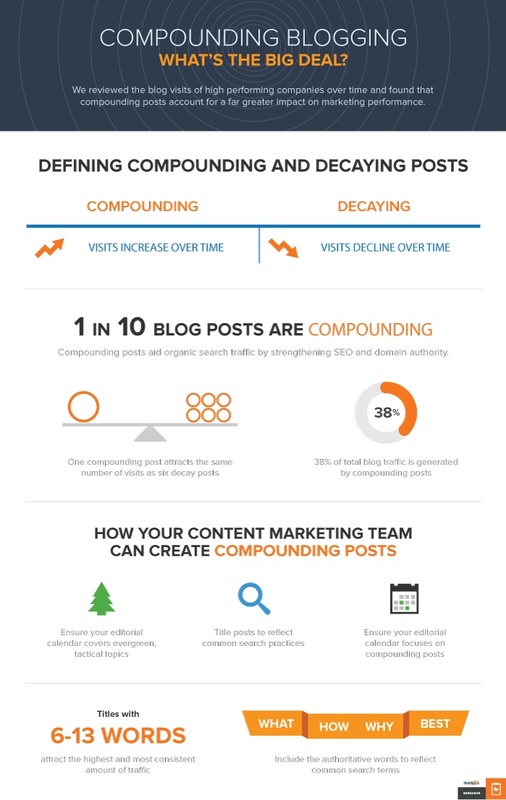 Compounding blog posts contribute to 38% of overall traffic. 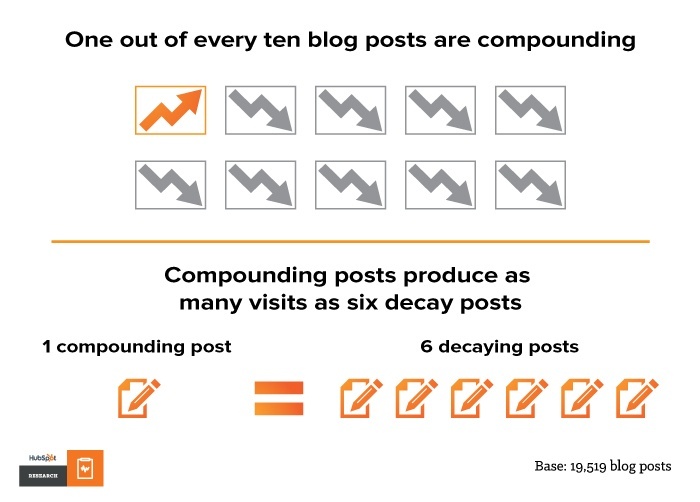 If 1 compounding post = 38/100 total visits, and 9 decay posts = 62/100 visits, approximately 6 decay posts would equal the traffic of 1 single compounding post. 4 Scott, D. M. (2010). Newsjacking: How to inject your ideas into a breaking news story and generate tons of media coverage. Malden, MA: John Wiley and Sons.